Current Developments in Biotechnology and Bioengineering: Synthetic Biology, Cell Engineering and Bioprocessing Technologies covers the current perspectives and outlook of synthetic biology in the agriculture, food and health sectors. This book begins with the basics about synthetic biology and cell engineering, and then explores this in more detail, focusing on topics like applications of synthetic biology, industrial bioprocesses, and future perspectives. 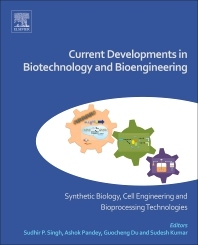 Information on cell engineering is also presented, and manipulation in endogenous metabolic network is studied alongside advanced topics such as fine tuning of metabolic pathways, de novo biosynthetic pathway design, enzyme engineering targeted to improved kinetics and stability, and potential applications of the novel biological systems in bioprocess technology to achieve the production of value-added compounds with specific biological activities. Assists in developing a conceptual understanding of synthetic biology and cellular and metabolic engineering. Includes comprehensive information on new developments and advancements. Dr. Sudhir P. Singh obtained his Ph.D. in the year 2011 from University of Lucknow, India. Subsequently, he worked as research associate and then as Project Scientist at National Agri-Food Biotechnology Institute, Mohali, India. He joined Center of Innovative and Applied Bioprocessing, Mohali, India in 2015, as Scientist-C. He has been working in the area of molecular biology, and synthetic biology. In the area of plant molecular biology his some of the significant contribution are: development stringently regulated expression systems for inducing male sterility and male sterility-fertility restoration system in plants, investigation of tissue and cell-type specific distribution pattern of mineral nutrients in wheat grains and its possible impacts on bioavailability, the first transcriptome analysis and molecular insights into seed development biology in the fruit crops, Custard apple and Litchi, and secondary metabolite pathways in Rose-scented geranium, development of approaches based on Rootstock-scion or modified viral genome based long distance signalling as possible strategies for inducing trait modification such as seedlessness. His current research focus is towards development of synthetic biocatalysts for biotransformation of agro-industrial by-products and residues into value added biomolecules. In the area of biosynthetic technology his some of the significant contribution are: development of novel approaches for transformation of agro-industrial residues and bioresources into functional and prebiotic biomolecules, development of a novel strategy for the improvement of operational stability of D-psiose 3-epimerase enzyme. He has been interested in employing the basic knowledge for translational research. He has published 33 research papers in peer reviewed journals, 4 review articles/book chapters, and 4 patents to his credit. Professor Ashok Pandey is currently Distinguished Scientist at CSIR-Indian Institute for Toxicology Research, Lucknow, India and Honorary Executive Director at the Centre for Energy and Environmental Sustainability- India; he was the former Deputy Director for CSIR’s National Institute for Interdisciplinary Science and Technology at Trivandrum, where he head the Centre for Biofuels and Biotechnology Division. Professor Pandey’s research interests are on bio-based economy for the production of fuels and chemicals. He has over 1000 publications and communications, which include 14 patents and design copyright, 34 books, 99 book chapters, and 391 original and review papers. Professor Pandey is the recipient of many national and international awards and fellowships, including Fellow of International Society for Energy, Environment and Sustainability, National Academy of Science (India), Biotech Research Society, India, and the International Organization of Biotechnology and Bioengineering. He was Chairman of the International Society of Food, Agriculture and Environment, Finland (Food & Health) from 2003-2004. He is Founder President of the Biotech Research Society, India (www.brsi.in); International Coordinator and General Secretary of International Forum on Industrial Bioprocesses, France (www.ifibiop.org), and Vice-President of the International Society for Energy, Environment & Sustainability (www.isees.org) and All India Biotech Association (www.aibaonline.com). Professor Pandey is Editor-in-chief of Bioresource Technology, Honorary Executive Advisors of Journal of Water Sustainability and Journal of Energy and Environmental Sustainability and editorial board member of several international and Indian journals. Prof. Pandey was also recently honoured as the Most Cited Author as per the Shanghai Ranking's Global Ranking of Academic Subjects 2016. Professor Guocheng Du is the Dean of School of Biotechnology, Jiangnan University, China. He is the distinguished professor of Changjiang Scholars, Ministry of Education, China. His current main research focus is on bioprocess engineering and metabolic engineering. He has about 200 publications/communications, which include 52 patents, 8 books, 160 original and review papers, etc. He won two Second Prizes of State Science and Technology Award in 2006 and 2012, respectively. He has been conferred Honorary Doctorate degree from Jiangnan University, China. Professor Guocheng Du is deputy director in the committee of biochemical engineering modelling and control, Chinese Society for Microbiology, and deputy director of Beer Branch, China Alcoholic Drinks Industry Association. He is the associate editor of Journal of the Science of Food and Agriculture and the editorial board member of Bioresource Technology. Dr Sudesh Kumar obtained his PhD in 2002 from the Department of Biochemistry, CCS Haryana Agricultural University, Hisar. Subsequently, he worked as post-doctoral fellow at ICGEB, New Delhi (2002-2004). He joined CSIR-Institute of Himalayan Bioresource Technology, Palampur in 2004 as Scientist. In April, 2016, he joined as Scientist-F at Center of Innovative and Applied Bioprocessing (CIAB). He has been working in the area of plant metabolic engineering and nanobiology and current research focus is towards improving the efficacy of hydrolytic enzymes through synthetic biology and nanobiology approaches for developing the efficient transformation process for biomass into value added products. Dr Kumar has published 110 research articles in peer reviewed journals, one book and 12 book chapters. His work has been cited 5000 times and has an h-index of 35. For his outstanding research contributions in the area of plant sciences, he has been honoured with many prestigious awards such as Indian National Science Academy (INSA)-Young Scientist Award- 2008, The National Academy of Science, India (NASI)-Platinum Jubilee Young Scientist Award-2009, Council of Scientific and Industrial Research (CSIR)-Young Scientist Award-2010. He has been awarded BOYSCAST Fellowship during 2008 by DST, GOI for conducting advanced research at UCR, Riverside, USA for one year. He has been also selected “NAAS-Associate” by the National Academy of Agricultural Sciences from 2013 and conferred “Prof. Hira Lal Chakravarty Memorial Award” of Indian Science Congress Association (ISCA) for the year 2012-2013. He has been honoured with “Haryana Yuva Vigyan Ratna Award” 2011-12 for his excellent research contributions.